It’s that time of year when you get ready to dress up your home indoors and out. If you’re looking for ways to make your front door more welcoming and merrier this holiday season, I’ve got a great collection for you. 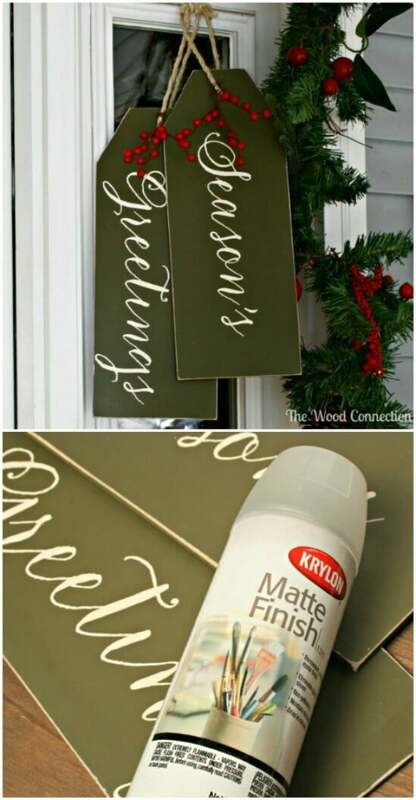 These 20 DIY Christmas door decorations are great, and they’re not all wreaths. While wreaths are the traditional front door decoration for the season, there are many other ways that you could dress up your entryway without hanging a wreath, and I’ve found several. Of course, wreaths are great, and there are plenty of them in this collection of 33 Festive Christmas Wreaths. 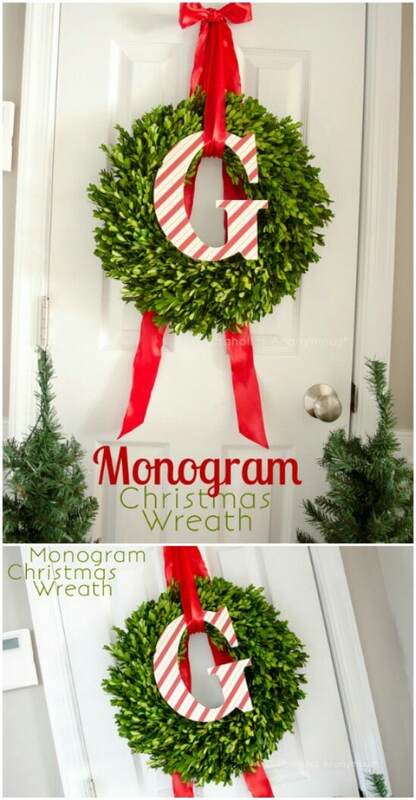 But, wreaths are just one way that you can bring in the Christmas spirit with your front door. 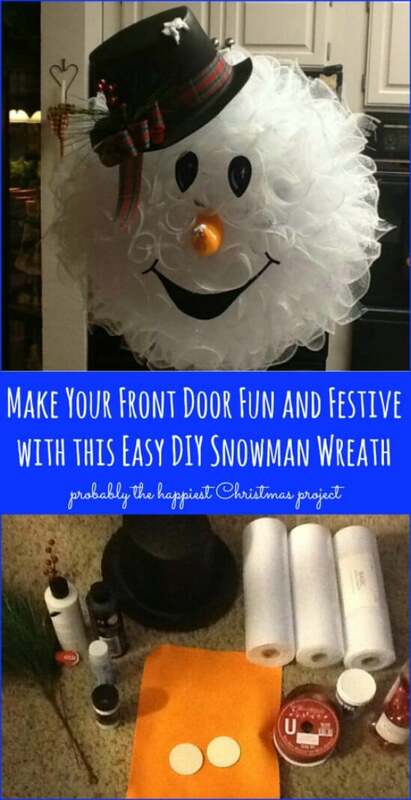 There are a number of really creative DIY projects that allow you to dress that door for the holidays without just hanging a wreath. 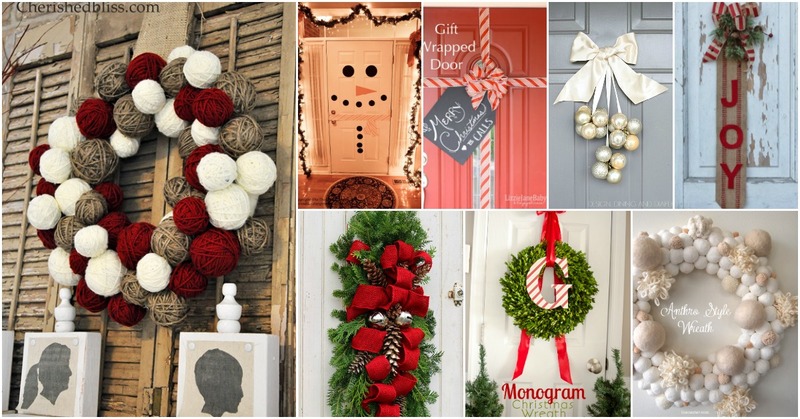 So, let’s get started looking at the many ways you can dress up your entry door this season. Don’t forget to take a look at my 40 Festive Dollar Store Christmas Decorations that you can DIY this season, as well. You can decorate the entire house, indoor and out, with these collections of DIY Christmas projects. Greet Santa with any number of great door decorations this year. Family and neighbors will also love the little extra touches that you’ve thrown in, and because these are DIY projects, you know they’re going to be cheaper than buying them in the stores. This gift wrapped front door is an excellent way to dress up your entryway for the holidays. If you’re looking for something that doesn’t include a wreath, this is it. It’s even got a tag with your name on it! You’ll need a ribbon, black card stock, a marker, and command strips to pull it off. So if you like the idea of a wreath, but prefer something a bit less traditional, this snowman wreath is perfect. He’s adorable and sure to brighten up the day of everyone who sees him. Plus, it’s a really easy project and one that you can pull off in just a couple of hours. Here’s another not so traditional wreath. This yarn ball wreath gives you the perfect rustic touch to your holiday decorating, and it’s easy to create as well. Different colors and sizes of yarn really make this wreath stand out, and you can embellish it with ribbon, twine, burlap, or whatever you prefer. 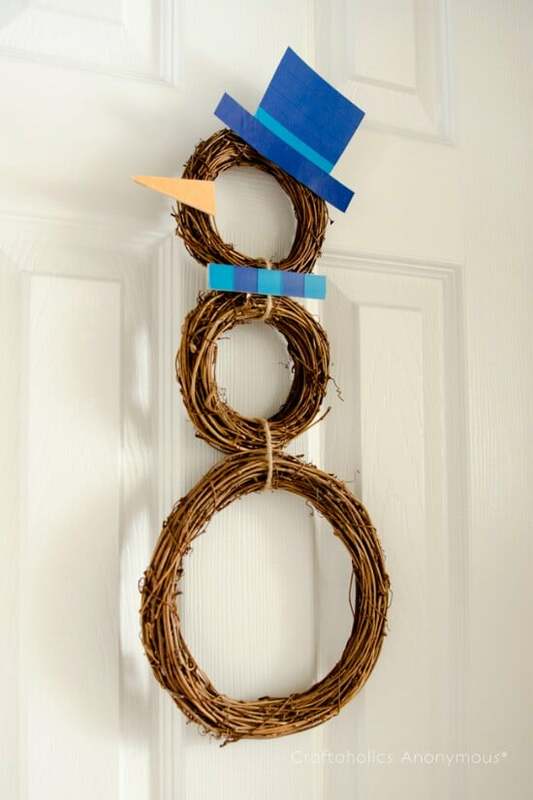 If you’re not in the mood to create a snowman wreath, how about just a snowman door? This is such a cute look and kids will absolutely adore it. It works best if you have a white door, but you could do it in any color. You basically just create your snowman by adding his face and maybe a ribbon for the scarf. Such an easy and cute project! Here’s another non-traditional wreath idea and one that kids will love. It’s made from candy canes that you tie together with wrapping ribbon. It’s so easy and really a gorgeous wreath when you get it finished. The best part? Once Christmas is over, you can take the wreath down and feast on it as the candy canes are completely edible. This is the most creative thing I think I’ve ever seen. It’s a Santa hat simply hung upside down and stuffed with festive flowers. You could literally fill it with anything from flowers and greenery to those tiny foil presents from the Dollar Store. The point is, the hat makes a wonderful door hanging if you prefer to skip the wreath this year. Spread some JOY with this gorgeous DIY door hanging. Burlap is such a wonderful holiday decorating material, particularly if you want your décor to have rustic appeal. This is simply a strip of burlap with a few embellishments. You don’t even have to spell JOY, you could do whatever message you want and then just add berries, bells, or anything Christmas-y to finish it off. 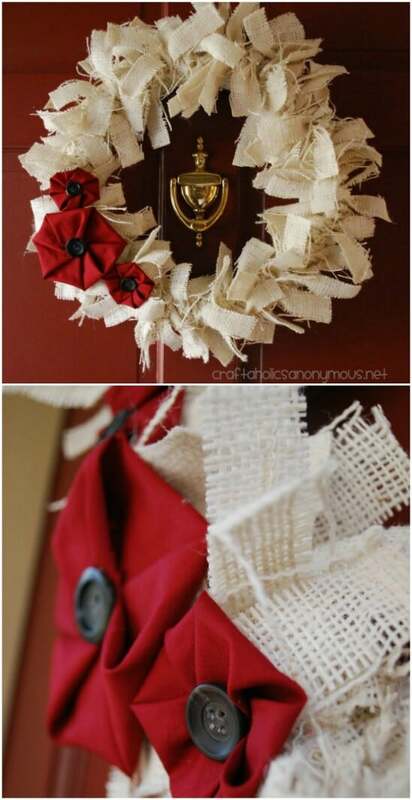 Use those extra ornaments to create this elegant door hanging. 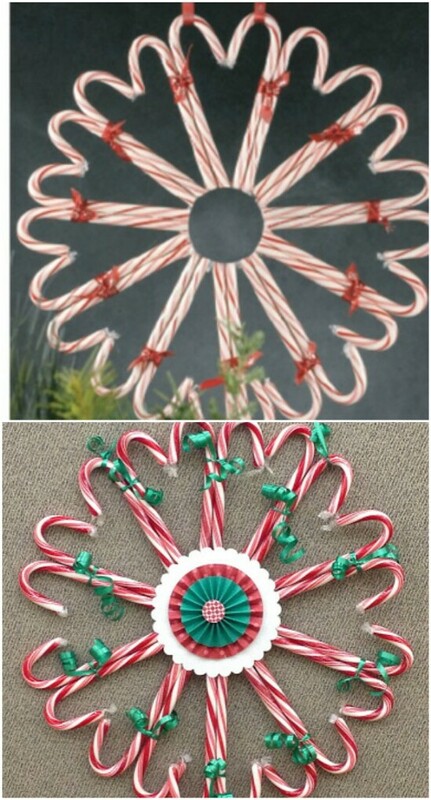 You can create this in less than an hour and you just need ornaments, ribbon, and fishing line. You just string the ornaments together into whatever shape you want, and then finish it off with festive ribbon and other embellishments. It’s a gorgeous hanging that takes so little time to create! Okay, so maybe you want a traditional hanging on your door. This Christmas swag is perfect if you want to keep some old-fashioned décor in your decorating. You need some trimmings like fir, pine, etc., along with a wire coat hanger, some floral wire, and a few other supplies. Grab whatever decorations you want to spruce it up from burlap ribbon to bells. This is such a festive swag and really easy to make. These giant door tags are the perfect way to spread some holiday cheer. You can even seal and prime them so that they withstand the snowy Christmas weather. These are relatively easy, even with the weatherproofing, and are a great alternative to a traditional wreath. Decorate with red berries to really give them a festive look. If you decide to go with a wreath and you want something a bit different, this monogram wreath is perfect. It’s easy to make and sports your family’s letter. The lettering is done in candy cane design although you could do a solid color if you prefer. I love the red and white against the green, though, and the red ribbon just really adds the finishing touch. Like the snowman wreath, this Santa wreath is made from tulle and he’s as adorable as his frozen friend. This one is really easy and a Santa hat tops it off. You can get really creative and add to it if you want, but the simple wreath is really gorgeous and will certainly add that bit of festive charm to your front door. Here’s another snowman wreath, although this time, we’re going to make him from grapevine. This is another great look if you want something with a bit of rustic charm. The different sized grapevine wreaths are perfect for assembling your snowman, and you can top if off with whatever decorations you want. You can find grapevines at your local craft store or at the Dollar Store in some areas. I simply love this elegant golden Rudolph wreath and he even has his famous red nose. The reindeer is paper mache, something the kids will love to help with, and the rest of the wreath is made from craft materials that you may already have on hand. Mix it up if you want and do the actual wreath part in a different color, although I think the cabana stripe ribbon is really cool. This winter wreath is made from….yep, pinecones and coffee filters. How awesome is that? And the look is absolutely gorgeous. This is one of those really easy to make projects that will look like you spent way more time on it than you actually did, and it’s a beautiful wreath to showcase on your entry door this holiday season. 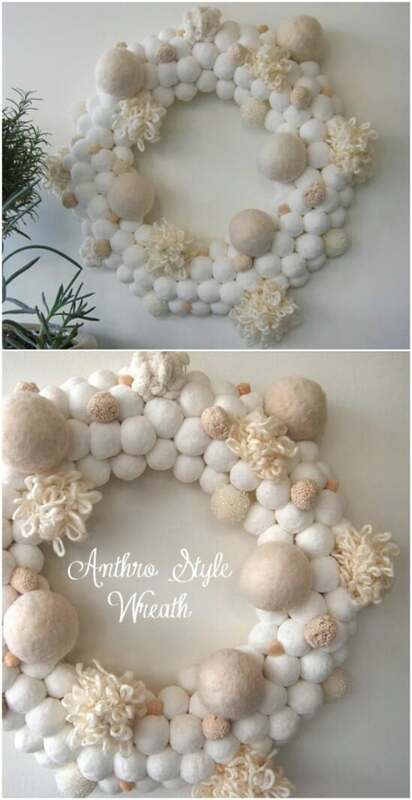 This snowball wreath is an Anthropologie inspired project…and it’s perfectly elegant. Trust me, this DIY version is way less expensive than the ones that Anthropologie sells, and people will not be able to tell the difference. You’ll need a few supplies like felt, wool, and Styrofoam balls, and honestly, it’s a lot easier to make than it looks. Torn strips of burlap make this wreath rustic and gorgeous at the same time. What’s great about this one is you can use any color of burlap that you want, so you can incorporate the browns and reds together to really make it look festive. You just have to cut and tie the strips around a wreath form. It’s relatively easy, and doesn’t take near as much time as you would think. This one is really different. 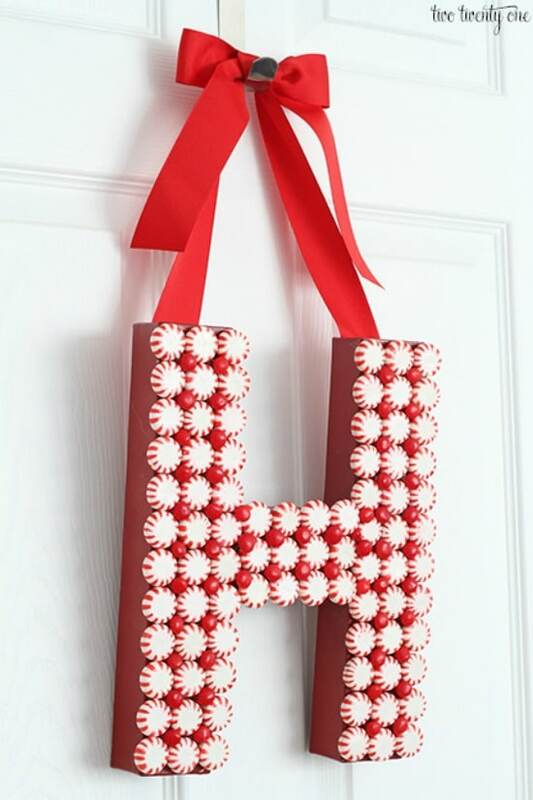 You take those little peppermint candies and use them to create a letter hanging for the door. Use whatever letter you want honestly. You could also do smaller letters and spell out Joy or Ho Ho Ho, whatever you want. Just glue the candies to the letter form and that’s about it. Those little foil presents at the Dollar Store, the ones you get for a dollar for several, make a wonderful basis for this holiday gift wreath. You can use a wire wreath form or if you want to save a bit of money, just take a wire coat hanger and form it into a circle. 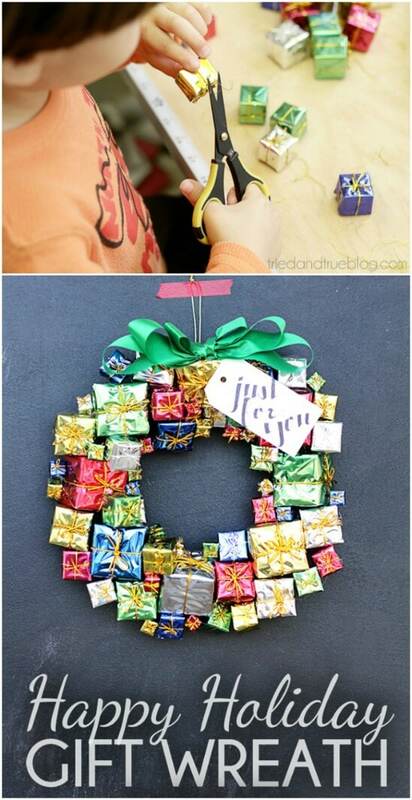 Then add your foil gifts and you can use the hanger’s hanger to hang it on the door. Finally, here is a gorgeous framed ornament hanger that is sure to bring festive to your home. If you don’t want to go with a traditional wreath, this is an excellent alternative. 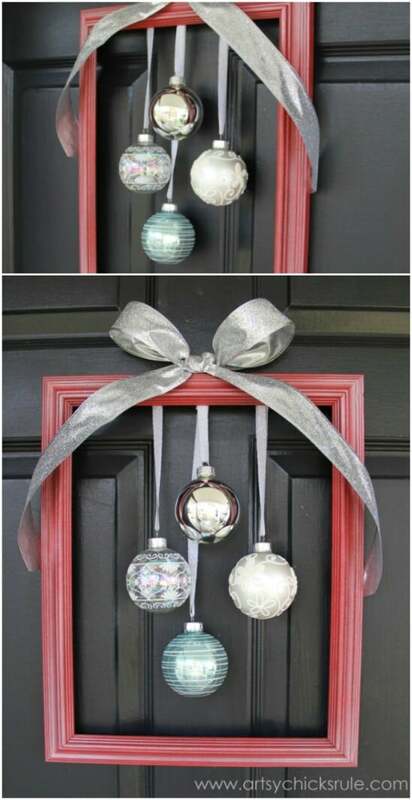 To make it, you’ll need a picture frame without the glass, some ornaments, and ribbon. It’s a lovely hanger and is sure to spark admiration from all who enter your door. May I add your blog ideas to my pintrest page? I will be sure to list your web address so people may visit your blog and perhaps subscribe.